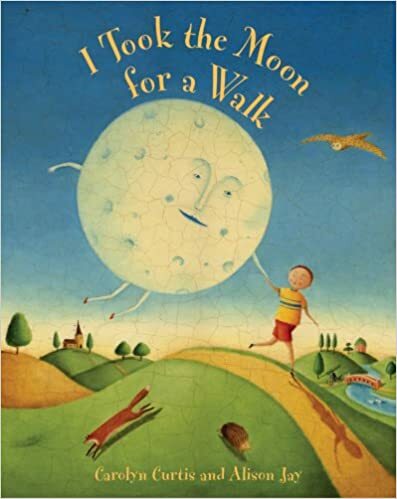 I promise this blog won’t become completely devoted to children’s books just because I spend seventy-five percent of my reading time looking at picture books now, but I Took the Moon for a Walk is absolutely worth talking about. My mother picked it up from the library when we visited back in September, and we loved it so much that she ended up mailing us our very own copy. Since then, we have read it every day, initially several times (by choice! ), although now it has settled happily into the rotation of before-bed books. Every night, I find myself thrilled to pick it up again. The story is pure poetry, and in fact, I wouldn’t be surprised to learn that it was written as a poem initially and then stunningly illustrated as a bonus. The musicality is exceptional. Each line flows gracefully across the page, and because we’ve read it so often, both my husband and I can recite it by heart, giving us ample opportunity to study the pictures. I know we wouldn’t read it nearly so much if our son didn’t love it as much as we do, but when we pull it out, he leans forward and studies each page intently. He’s only ready for the next page when he turns away, usually studying the illustrations for a minute or two (a long time for a five month old’s attention span). While I certainly try to read him books that I enjoy as much as he does, this one delighted both of us so much from the very first reading that I can’t imagine a day when we don’t want to look at it (although inevitably, time will sneak up on us and that will happen). When my husband read it for the first time, he said to me, “Why can’t all children’s books be like this? Look at the vocabulary he’s learning! The meter! The rhyme!” Incidentally, he had just been lamenting the fact that too many of the board books we owned seemed, in his words, “too basic and boring.” While I agree that some books written for children are so dull I would rather eat paste than read them repeatedly, I pointed out that for infants, even something “basic” was still, well, novel. Books are windows into the world for young and old alike, and even though many trivial concepts (See Jane. See Jane run! Run, Jane, run!) seem obvious, for babies, it’s all brand new! That being said, I knew exactly what he really meant. A book like this is an elegant dessert rather than a poorly prepared side dish. It’s a treat, and I fully believe that our love for it encourages, even at such a young age, a special reverence for excellent books. And that is something I dearly want my child to understand. 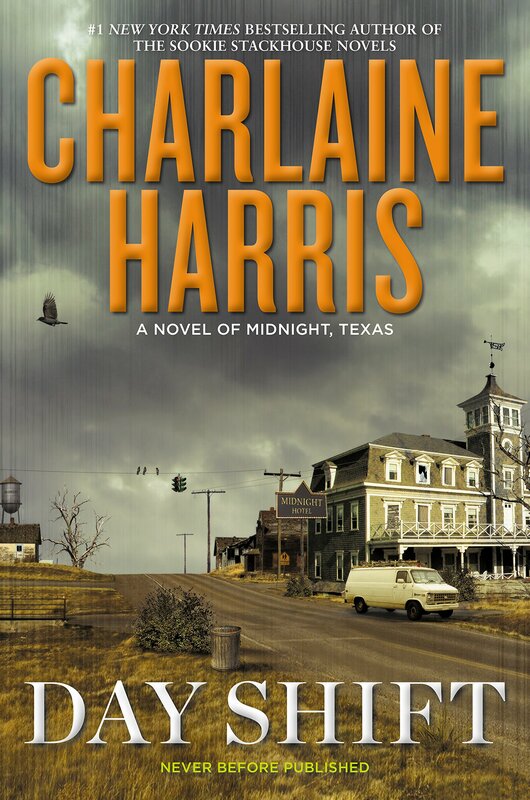 This is the second book in Charlaine Harris’ newest series about Midnight, Texas (existing in the same world as her popular Sookie Stackhouse books but sharing only a few overlapping characters, though each book has introduced someone “new” that her faithful readers will recognize), and while I wasn’t crazy about the style of the first one, I like her enough as an author that it was a no brainer to pick it up. I suppose it was especially interesting to me since I spent the last full week of September in Austin, Texas struggling to find free activities appropriate for a three month old and his extremely sweaty mama. Previously, my experience with Texas had been limited to driving through it last year on our long road trip (and one very bad airport experience in Dallas). Before we’d started on that leg of the trip (it took about two and a half days to make it along the diagonal route we’d chosen), many people had warned us about how “big” Texas was – in this case, “big” implied, not very subtly, “awful,” and I steeled myself for what I expected to be an ugly and dull drive. As it turned out, Texas, while exceptionally large, was also beautiful. It ended up being one of my favorite parts of the drive. We passed through a bizarre mix of western and southern landscape, blended in Texas unlike anywhere else I had ever seen. When we got to Austin, the feeling that we were in a unique state intensified. Many parts of the city felt reminiscent of a jungle in their lushness, although apparently the area was experiencing a years-long drought up until just a few months ago. At the same time, the skies were as huge and open and blue as any I’ve fallen in love with in the West, and the people I met were unfailingly friendly and generous to a struggling new mother. It made Harris’ town of Midnight that much more intriguing to me. Her characters, while cautious around strangers, seemed so warm. Before visiting, I might not have believed that a whole group of people could exhibit such similar conflicting tendencies – a desire to share food and conversation with an intense need for privacy – but now I’ve seen it. There is a place where people have an edge of southern charm tempered by a frankness I associate with the middle of the country, and that place is Texas. Those are neither good nor bad on their own, but undoubtedly make for excellent character fodder. I can also understand why Harris would be drawn to writing about such a place. In the US, so much land has been bought up and developed that it sometimes feels impossible to find stories that exist on the outskirts of civilization. In Texas though, huge swaths of it still exist where no one can live, or where very few choose to, and the opportunities such places afford a storyteller are as vast as the distance between two tiny towns on a deserted stretch of highway. That being said, I still find this series a little more stilted than her earlier work. She hasn’t quite settled in with a male protagonist the way she has with the various women she’s written before, but I’m hopeful that as she gets to know him better, Manfred will come to life as joyfully as Sookie or Lily or Harper do. In the meantime, I’ll happily dive into her Texas from the cool comfort of our autumn weather at home! A few weeks ago, our family flew back east so that we might visit with relatives while I was a bridesmaid in my best friend’s wedding. She and I have been friends since we were ten years old, and along with her other best friends (one she’s had since infancy and one from college), I was asked to give a joint toast – no small feat with just a few weeks notice and a brain that felt like it was composed of rice pudding. This section described my friend to a T, and after reflecting on it for a few minutes, I was able to write the toast I really wanted for her. When I got together with my co-bridesmaids and read their drafts, I realized this section really had been the perfect inspiration – if I hadn’t known better, I would have thought we’d all read it and based our speeches on the very same idea. Unfortunately, not all of us are friend magnets. Most of us have to work incredibly hard at making and maintaining friendships as adults. It takes a lot of work, and when combined with family, professional obligations, and hobbies, it can be difficult to find the time. I found that after I quit my job and started working from home, it became a hundred percent more important to me to do this. The energy it took was completely worthwhile because without the friends I was making (and keeping) my life would have been very lonely indeed. Now that I’ve entered the ranks of parenthood, it’s become even more crucial that I have friends both with children and without, and that I have time with those friends both with children present and without. I love my family very much, but it would be cruel to ask them to be everything for me. I crave the confidences of the women who have become my dear friends. I love the laughter of a rowdy dinner party. I get excited to go on a hike (even when accompanied by tiny-legged people who make for a long time walking a very short distance). Healthy friendships make me a more clear-headed person, and I say that as an introvert who also dearly values time alone. The wonderful thing about Paul’s book is that she not only discusses the importance of such friendships, she also offers a roadmap to finding the kind of people her readers might want as friends. She provides resources for networking (whether professionally, personally, as a parent, via a hobby, etc) and techniques for approaching new people. 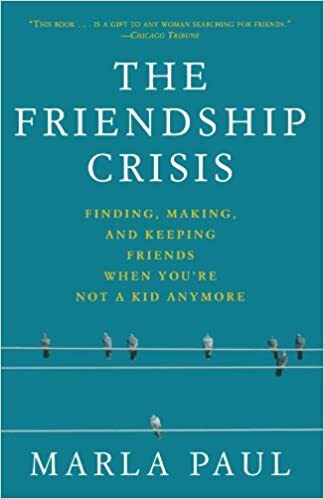 She also discusses the challenges that may arise both in starting new friendships and maintaining older ones and is open about the potential for failure. Not every person is meant to be a best friend, and some may never be more than a casual acquaintance – or nothing at all – but she assures us that it’s okay. Sure, not everyone is right for us, but some people are, and those people are just waiting to connect if we’re willing to work at it.